This year, we again had a 0 in our ‘losses’ column. But more importantly, it was accompanied by a 0 in the ‘draws’ column. 34 games. 34 wins. I don’t consider myself ridiculously good, and I’d like to think we haven’t been overly lucky. There’s been one or two games where we could’ve easily drawn and it would’ve been a fair result, with the last match of the season against Hoffenheim being a particular worry. But aside from that, putting out strong teams every week meant we’ve just blown everyone else away fairly easily. The quality of our squad is just leaps and bounds further ahead of every other team in the league that we always had a player capable of turning the match in our favour. 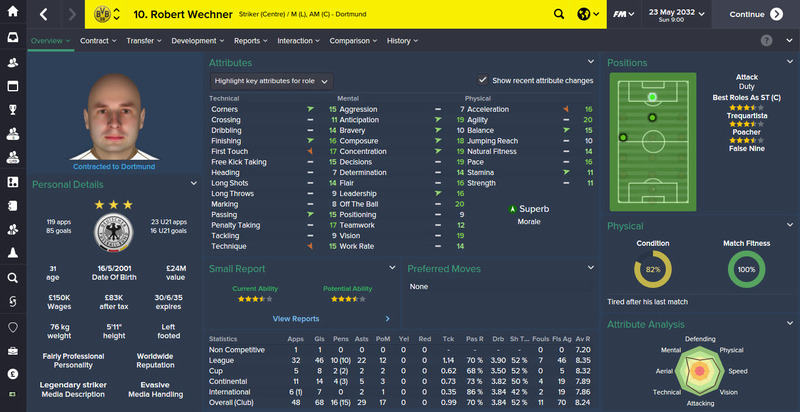 None more so than Robert Wechner. It’s probably a bore to hear about his triumphs every year, but this was his best season to date. Despite tearing his calf muscle at the end of last season and missing out on pre-season, he had no other injuries at all; which is unusual for him. This meant he could feature regularly, and amassed a club-record 68 goals as well as 29 assists in his 48 games. With 17 PoM awards and an average rating of 8.24, he often won matches on his own. He’s reached the stage where his technical & physical attributes are remaining fairly constant (there has been some depreciation), but his mental attributes are exploding. He’s had more support this year after we eventually went on a spending splurge last Summer. When I say a ‘spending splurge’, I mean that we actually spent the money we made from transfers this year. With a number of talented attackers coming through and some money to spend on a few ‘galacticos’, Neto & Mario Caseres were each sold comfortably and for big money. With an abundance of full-backs, Emerson, Alfonso and Tammo Pieper all moved on for very reasonable fees. At no point were any of these guys considered regular starters. The idea now was to use their fees to find better full-backs than our current starters (Popovic & Olsson). This was successful. And this was only because we bent one of the rules I’ve kept this whole save; don’t buy old players for big fees. Well, Finn Nys & Angel Ferretti are both old and both cost a huge amount. Finn Nys: another example of bringing an ex-Dortmund player back, having sold him to Man City for a touch under £50m a few years ago. Angel Ferretti: one of PSG’s best and most important players; capable of playing in any right-back role in any system. Well worth the cash. Aleksander Popovic: a wonderfully talented two-footed full-back capable of playing either side (and also acts as a backup CB in emergencies). Patrik Olsson: much like Popovic, the fact he can play other positions meant signing two world class FBs made sense. Still managed to get heaps of game-time, and his presence means we can still select an attacking-first RB in games we’re expected to dominate. Having a fairly small squad, with a number of those players able to cover many different positions, means pretty much everyone got loads of game-time. One such player who didn’t get much game-time (607 minutes over the season) was new signing Emmanuel Reyes. Emmanuel Reyes: a bargain at £9m. Unhappy with his current situation but I’d like to keep him around as he provides vital backup. Seeing the fee Juventus wanted, I knew he’d be a better backup to have around than Milan Zapletal, who I then loaned out. If Remy Arama got injured, this guy could step right in. That didn’t happen, so he ended up whinging about the lack of game-time and I played him even less because of it. The only other player with under 1000 minutes for the season was new signing Joe Cross (with 790 minutes). 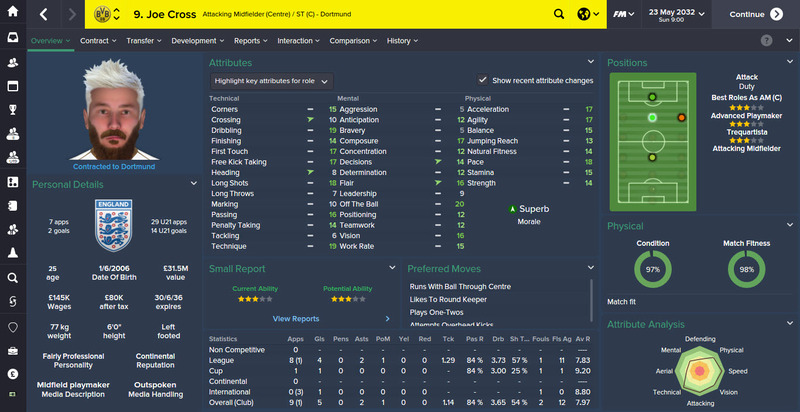 But this lack of minutes was because Cross signed in January, and then only days after moving, he tore his hamstring. This was really disappointing for a number of reasons. Spending £48m in the January window on Cross might seem a lot, but then consider that we had a £100m bid rejected in August. Whether I would’ve pursued with the move if that bid was accepted, I don’t know, but I do know that I wanted him badly. He’s a wonderful player, and perfect for the system we play. With Robert Wechner leading the line, we don’t need a traditional #9. And therefore giving Joe Cross the #9 shirt to play on the right of midfield (RAM) felt right. He played mainly as a striker at Everton, but I feel he’ll be perfect as an IF-A at RAM, in our 4-2-3-1. Joe Cross: that hair-beard combo could use some work, but his ability on the pitch is unquestionable. Look at those attributes. I’m a sucker for high Off the Ball & Dribbling. The fact that he was injured for that time means he’s not yet learned to play the RAM position as I’d hoped. He won’t be able to hit the ground running next season. Annoying. Cross’ ‘discount’ signing also seems to make the presence of £58m man Alex Garcia largely redundant. Alex Garcia: the player we signed in the Summer when Joe Cross seemed unobtainable. A fantastic playmaker, but we’ve got a number of those. Garcia got plenty of game-time with Cross not playing until April. But there’s a chance he’ll be sold this Summer. Largely because of the presence of these three excellent young attacking midfielders we have. Roman Devico: the versatile backup of the three. Capable of covering four roles in the 4-2-3-1 and therefore a valuable squad member. Ananias Gomes Barbosa: Off the Ball + Dribbling = Success. Constantly the best performing of the three, and therefore rewarded with a mega new contract. A wonderfully talented player that always makes team selections difficult. Bernd Schmidt: probably the best attributes of the three, and definitely the most German, but we never seem able to unlock his full potential. Getting him into the AP-S role consistently might help. But there’s so many competitors. Baby wants a new challenge, and has requested a move to PSG. Unless they pay a world record transfer fee, they can bugger off. 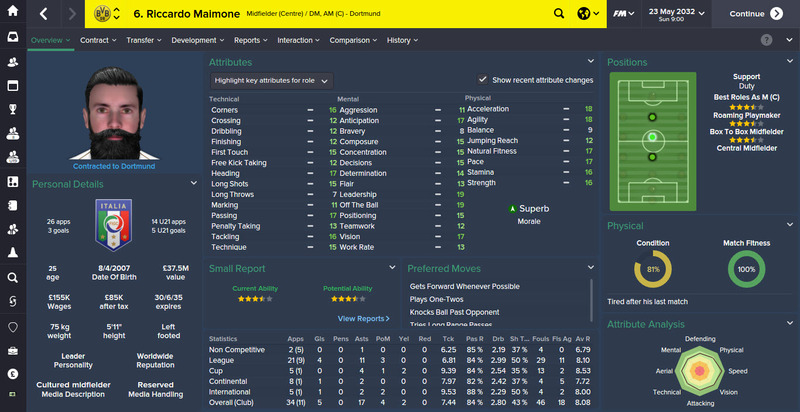 Then there is Riccardo Maimone who is almost the perfect box-to-box player. And his performances in big games mean he is a lock for any difficult opponent. 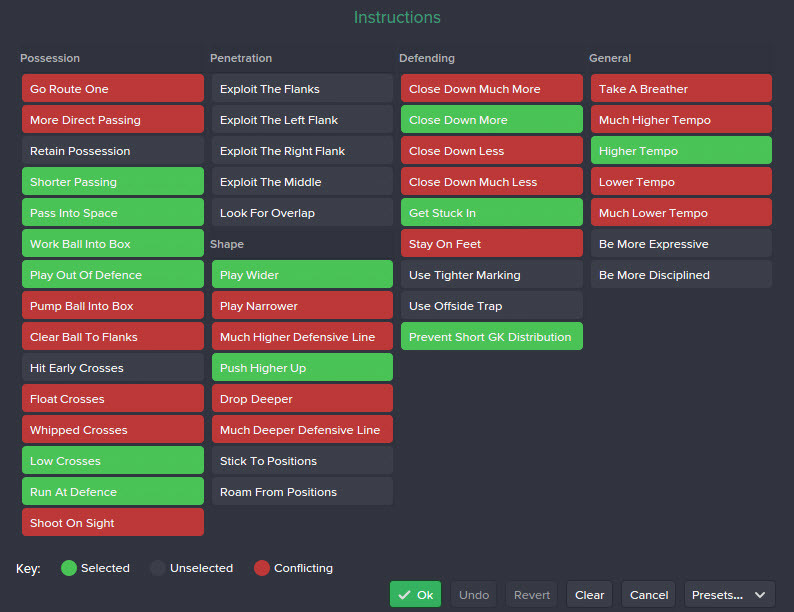 This tactic can be slightly adapted depending on the opposition and the occasion. But it’s built around Dribbling & OTB. Run with the ball and without the ball. Fluid movement, and fast dribbling. Which is why Barbosa is probably doing so well, over Schmidt. If anyone wants to make the case for keeping Schmidt, and perhaps even the same for Alex Garcia too, then do so in the comments or [[[on Twitter]]. I’d love to give Barbosa more games next year, but both those guys are really talented players. It’s going to be so much fun next year, as we create a ‘Very Fluid’ 4-2-3-1 at home, and only play the top Off the Ball attribute players. Wechner (ST) 20, Cross (RAM) 20, Maimone (RCM) 19, Barbosa (CAM) 19, Olsson (LW) 19, Baby (LCM) 19. Chaos. Adding to the 6 Champions League medals would be nice. Having won the Champions League this year, we are now entered into the European Super Cup and the Club World Cup. Winning all of the trophies it’s possible to win might just be the last objective to aim for. Going the whole season without losing a single game in any competition (again) would be nice, too. I actually completed an unbeatable season myself in spanish Segunda Division. Having been promoted in the season prior to that and with a media prediction of 11th I drew maybe two or three games and won everything else in the league. Crazy season! I really like your idea of using players with high off the ball skills. Looking at my current squad with Stades Rennais FC, my best four players in that category all have a value of 14. I definitely make that a priority in the next transfer window. May I ask which mentality you are using with that tactic? And what kind of adjustmenst do you usually make if facing a tougher opponent? I use control, but alter it either up one to Attacking (easy home matches) or down one to Standard (hard European away games). & great to hear. I think OTB is one of the most undervalued attributes, and it creates some wonderful football. I’m really looking forward to getting Barbosa, Cross & Wechner in full flow together. Be sure to let me know how it goes with Stade Rennais. I’d say achieving an unbeaten season in a second division is an even better achievement. I’ve spent years refining the squad, whereas you do that in the second division and you’re suddenly up into the first — it takes some really quick improvements to go unbeaten there. Congrats. Will you put your tactics up download? As they seem really solid! Hey mate do you still post on your blog? 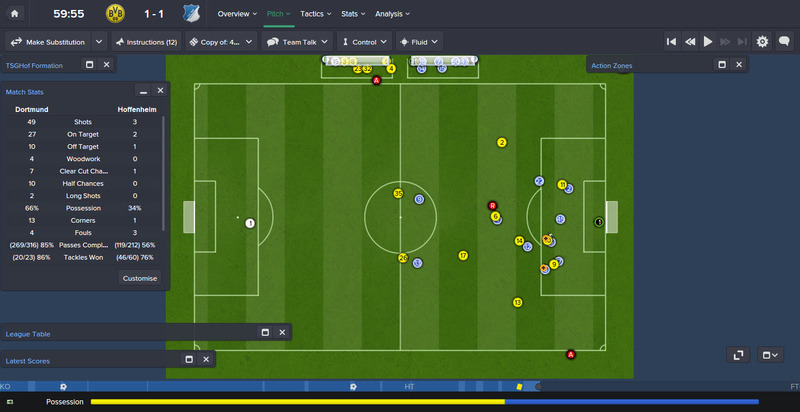 Probably the best written content on FM I’ve seen. 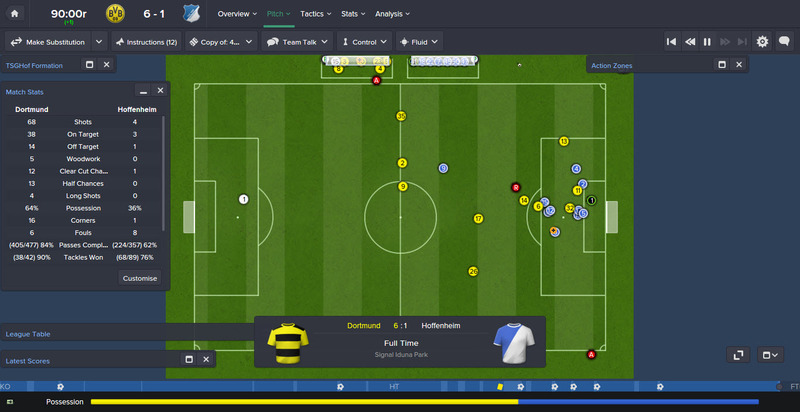 Unfortunately I’m not playing much FM these days, so obviously the urge to write about it is also much lower. Thanks for the nice comment though, I appreciate it. Who knows? As long as I can hold off the urge to play, I imagine. I really liked your blog because it gave me ideas to base my team around and was very insightful. It seems as if the continuous winning has dulled your urge to play. When will be coming back and could you upload your save game for FM2015, it seems I have been afflicted just like yourself and need some inspiration.